← Come See our New Play about Community Health and Disaster in Portland! Come join us for a free 2 hour training about keeping you and yours safe while protesting for a better world. We’ll cover identifying police tactics, action preparation, and talk about those strange and illustrious medics you see roaming about with red crosses. 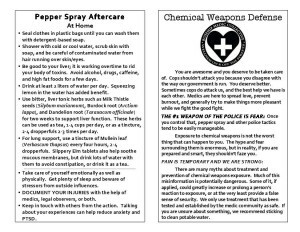 This is a 1 page front-and-back handout covering preparations, treatment, and aftercare for chemical weapons and other forms of police violence. It also includes ways to access help from street medics and other volunteers. For sound legal advice regarding interactions with law enforcement, see http://www.midnightspecial.net/files/dealingwithpolice.pdf or and other resources provided by the now-disbanded Midnight Special Law Collective.